To realize Industry 4.0 more efficiently and make it more reliable in factory or equipment application, it is crucial for device to equip with edge computing ability. Edge intelligence could make data-driven decision and boost productivity. Allied with diverse software partner, Advantech provides a brand new series of Edge Solution-Ready Platform (Edge SRP), that equipped with different edge computing ability and numerous services to satisfy the market need right away! The Intelligent Edge is the new frontier of computing, harnessing the power of multiple edge technologies to connect online and offline data, realizing the progress of Industry 4.0. Edge SRP could play different role with its special software function, such as, Edge Data Collector, Fieldbus Controller, Centralized Visualizer, Edge Analyzer, and Fault-Tolerant System. Advantech Edge Solution-Ready Platform(Edge SRP), integrated with variant software-defined data services, upgrading the application of data, is the best platform for you to intelligentize equipment, exploring the new business inception of Industry 4.0! Leveraging over 20 years of industry experience to develop industrial communication products that provide reliable wired and wireless communication solutions for mission critical applications, Advantech officially introduces 4 network-focused Edge SRPs, offering a wide range of services ranging from protocol convention, centralized management, to fault tolerant systems, realizing IoT-powered business models in various vertical markets. 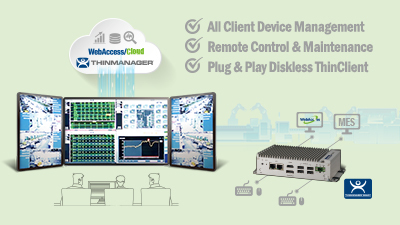 Advantech WebAccess/VCM is a video core module of intelligent and monitoring system. WebAccess/VCM could instead your existing DVR or NVR systems for a comprehensive security system with video analysis capability. This total solution includes an edge intelligent system which will generate event and attribute data via WebAccess/VCM SDK APIs. It can be easily integrated into a central control system like Advantech’s WebAccess/SCADA system, or other upper-level systems as the total solution. An OPC sever(OLE for Process Control) provides IO and more devices to communicate with a wide range of HMI/SCADA software packages residing on a host. Advantech' s OPC server for ADAM and modbus devices features OPC DA(data access) and AE(alarm and events) client for the rapid testing of data connections, supporting Advantech's modbus devices, such as MODBUS/RTU and MODBUS/TCP. Any software system with OPC client capabilities such as OPC DA and AE sever can access the Advantech OPC server drivers.